Business Policy Deployment includes your strategy, policies, procedures, and work instructions. Your Policies and Procedures Manual Template is also referred to as a Standard Operating Procedures Manual or SOP manual, which focuses on your critical daily tasks that must get done for your business to continue. Many people find it difficult to get started, wondering what to say, who should write the SOP manual or what needs to be included? You don’t need to document everything your business does, just those things that are critical to safe and efficient operations. What do you need to get started? Business metrics are critical to running your business. A good starting point is operations: Quality, Cost, Delivery, and Service or Customer Satisfaction to name a few. The actual values you strive for are derived from your strategy. The linking of your metrics to your processes represents your organizational strategy, which is fulfilling your mission/vision/policy statements. This is the policy deployment process at work. Your procedures and work instructions represent the “how” in how your are going to realize your strategy. Your strategy documents help provide the context for your procedures to explain why a task is being carried out and will provide a check step for aligning your procedures with your policies to show how your strategy is working. Your process maps answer the key questions: what to say, who should write the Policies and Procedures Manual Template or what needs to be included? Using the process map to the right, we can see we will need a person (process owner) from each of the five core processes depicted in the process map. Our Policies and Procedures Manual Template will have at least one procedure from each of the five areas pictured plus, additional procedures for the support processes (Management, Accounting, IT, HR, Quality). What do you need to include? You will need to describe the sequence and interactions of each process arrow. 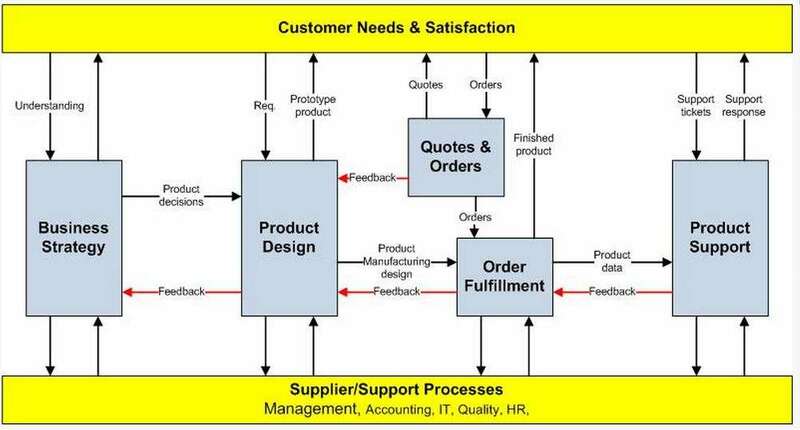 Notice product design gets requirements from the customer, product decisions from strategy, feedback from quotes & orders and order fulfillment, and also receives support from the support processes. Product design also provides prototype products to customers for testing and product manufacturing designs to manufacturing for manufacturing engineering, tooling, and setup. For each arrow you need to mention who provides what to whom and when or how often does it happen? What records, reports and forms are used? Are there schedules to follow, Key Performance Metrics (KPIs) to achieve, or standards that must be followed? Your procedures need to describe this critical business information. You will want to standardize your Policies and Procedures Manual Template so that each procedure looks similar to all the others. Using a Standard Operating Procedure Template, you will be able to communicate to everyone the procedure format you want to use to standardize your procedures. Put together your Policies and Procedures Manual using a logical flow or order to your procedures. Start the operations manual with your process map. List your procedures that explain each business process. Include each individual procedure with references to each record or form needed. New employees will find your Policies and Procedures Manual Template especially helpful in getting up and running as fast. To see procedure examples, download free Policies and Procedures samples. Why Use Policies and Procedures Manuals? What Is a Policies and Procedures Manual? What Are the Steps to a Policies and Procedures Manual?